The great international event, the Monaco World Sports Legends Award, has just taken place in Monte Carlo. It is for sport and its finest champions what the Oscars of Los Angeles are for the cinema and its actors. The Media Day was held on Friday 7th December while on Saturday 8th the 3rd Award Ceremony and Gala Dinner-Show with Red Carpet was held in the Salle D’Or of the Fairmont Monte Carlo, situated in the famous bend of the Formula 1 Grand Prix. 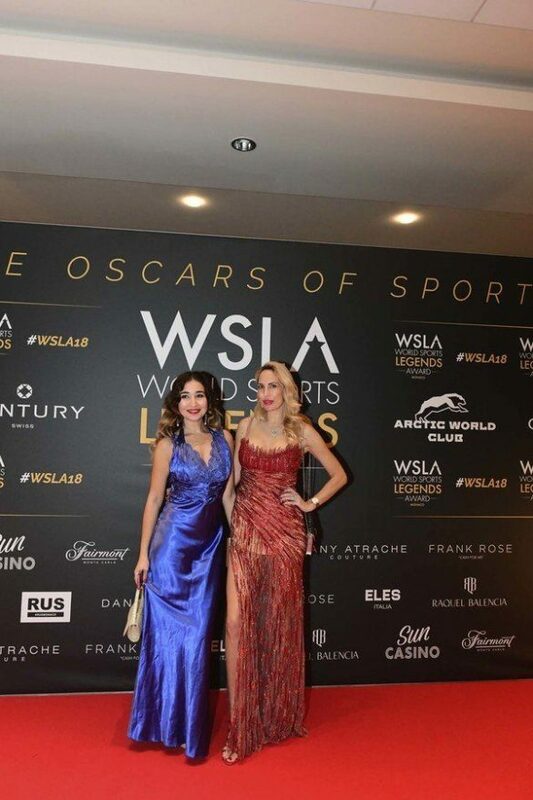 It was an unforgettable and superbly elegant evening, produced by Promo Art Monte-Carlo Production and bringing together sporting stars with entertainment, art, fashion and glamour to make the WSLA a unique international showcase and an exclusive VIP Red Carpet: the Oscars of Sport. The event was presented by the international ballet star Lorena Baricalla, Ambassadress and Master of Ceremonies for the Monaco World Sports Legends Award. 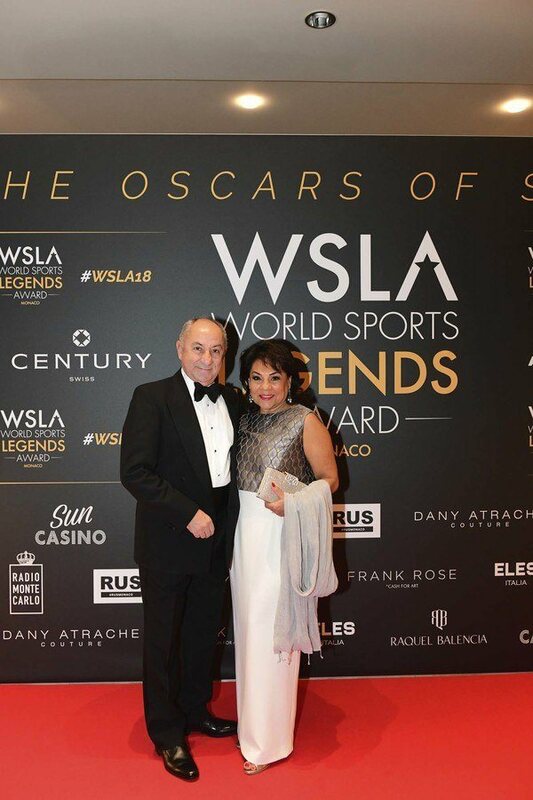 Again for this 3rd edition, the list of those who received the World Sport Legends Award presented the greatest world sporting champions: Osvaldo Ardiles from Argentina, Football World Champion, Jutta Kleinschmidt from Germany, the only woman who has won the Paris-Dakar and Freddie Spencer from the USA, 3 times World Champion MotoGP. 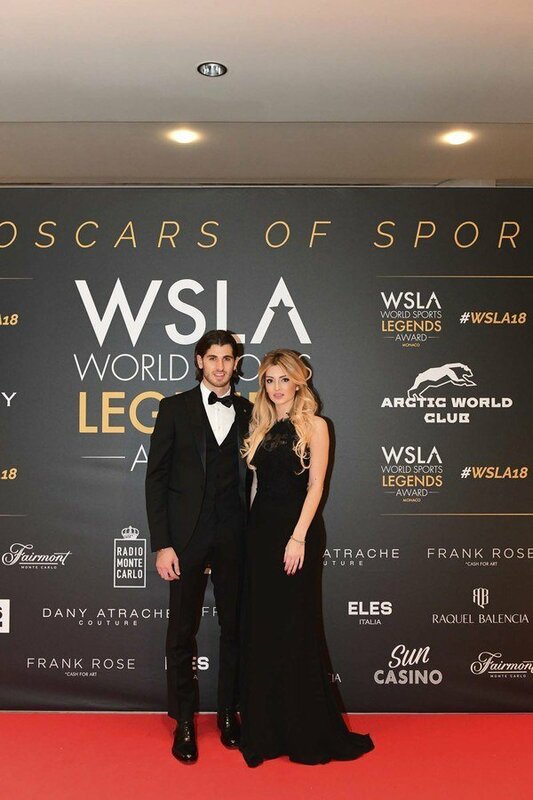 The WSLA Posthumous Award was given to the Brazilian, Ayrton Senna 3 times Formula 1 World Champion and one of Formula 1’s greatest legends. The Award was received by his niece, Bianca Senna, President of the “Instituto Ayrton Senna”, who came expressly from Brazil. 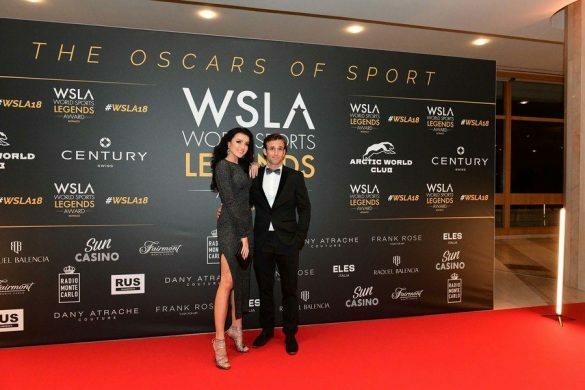 Lastly, the WSLA Best Values for Community Support recognized Doctor Claudio Costa, the Italian doctor and founder of the Mobile Clinic in MotoGp, which has saved the lives of many champions. 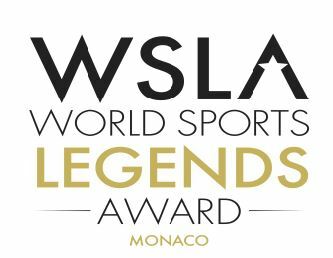 in 2016 Giacomo Agostini, Carl Fogarty, Mika Häkkinen, Tia Hellebaut, Sir Anthony McCoy, Jean-Marie Pfaff, Grand Master Jhong Uhk Kim, Pernilla Wiberg, Victor Tello (WSLA Best Values Award for community support), Antony Noghès (WSLA Posthumous Award received by Noghès Family). 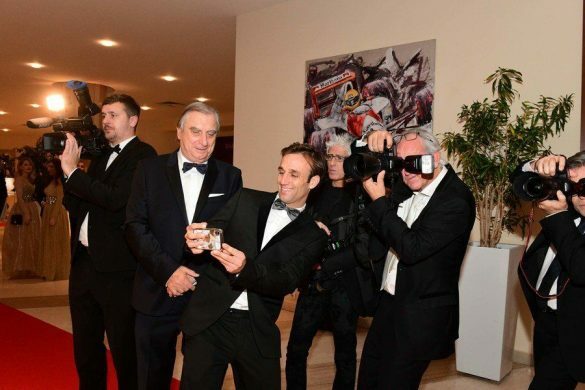 In 2017 Michael Doohan, Jacky Ickx, Josefa Idem, Michèle Mouton and Armin Zöggeler. The prestigious Prize awards sporting champions, men and women, both active and retired, who have gained distinction not only for their sporting exploits but also for their example, which is an inspiration for the new generations. 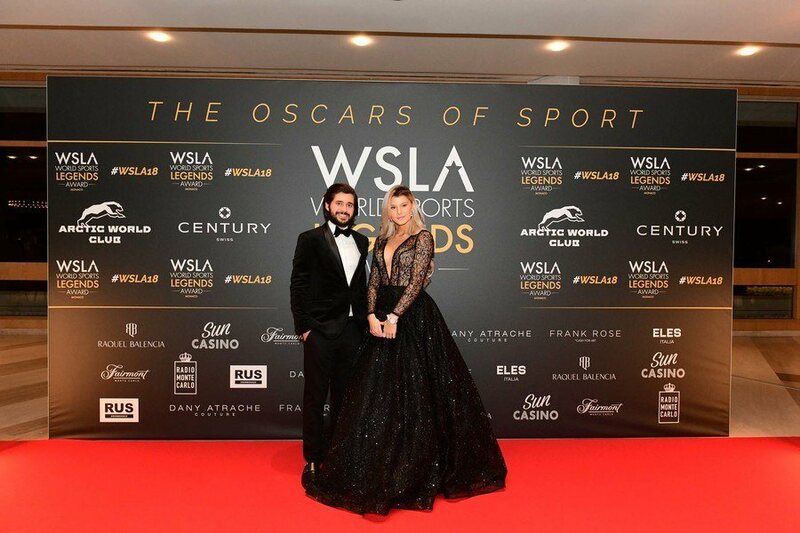 The special prize “Best Sports Values” awards an athlete who stands out for an exemplary sporting gesture which embodies sport’s ethical and moral values, or to well-known people for their community support through sport. The “Posthumous Awards” is conferred on great champions with legendary careers or to well-known people who operated in the sporting sector. The Awarded enter the Pantheon of the World Sports Legends through their handprints. 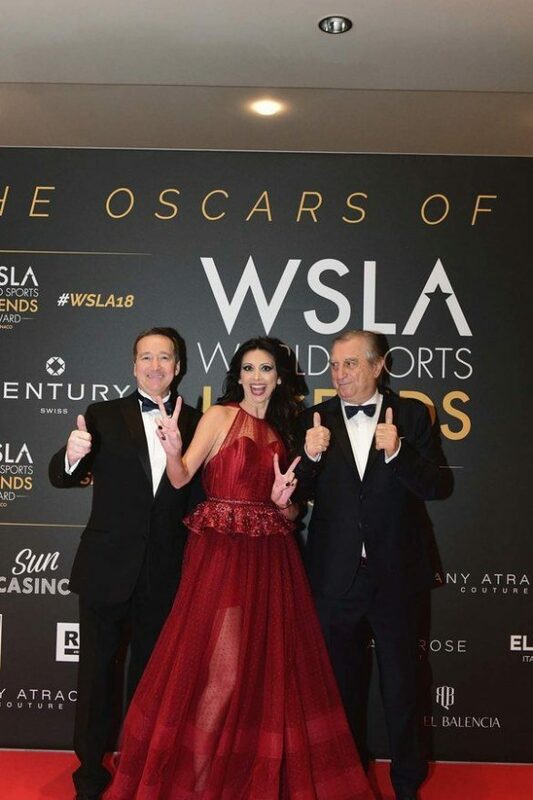 It also benefited from the support of the Automobile Club of Monaco and the Monte Carlo Board of Tourism and Congresses, and as well of the partnership of the Sun Casino. 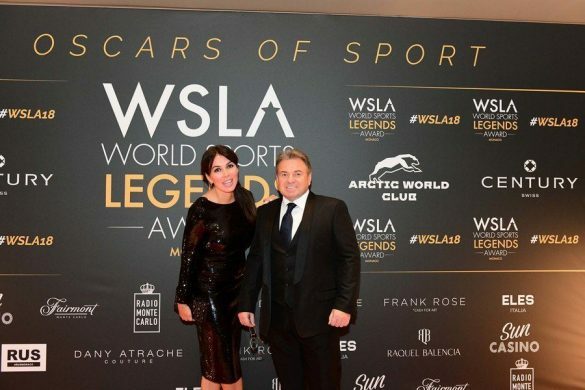 For the third consecutive year Radio Monte Carlo of the Mediaset Group was the Official Radio of the WSLA. Officials partners of the event were the Swiss brand of luxury watches Century Time Gems and Arctic World Club with its President Sergey Egorov, an international organization that has active development of the Arctic region as its goal. Since its establishment, the Club’s activities have been closely l inked to business, science, culture, sports and charity events in Russia and abroad. Another partner was the Frank Rose company, which operates in the lifestyle and art sector. RusMonaco was the Official Magazine for the WSLA. Key moments throughout the two-day event highlight fashion and glamour. Accordingly, for the Award Ceremony and Red Carpet, the Master of Ceremonies Lorena Baricalla wore four haute couture gowns in precious fabrics from the 2018 and 2019 collections by the renowned Franco-Lebanese fashion designer Dany Atrache whose creations are paraded at the Paris Haute Couture Fashion Week. As well. 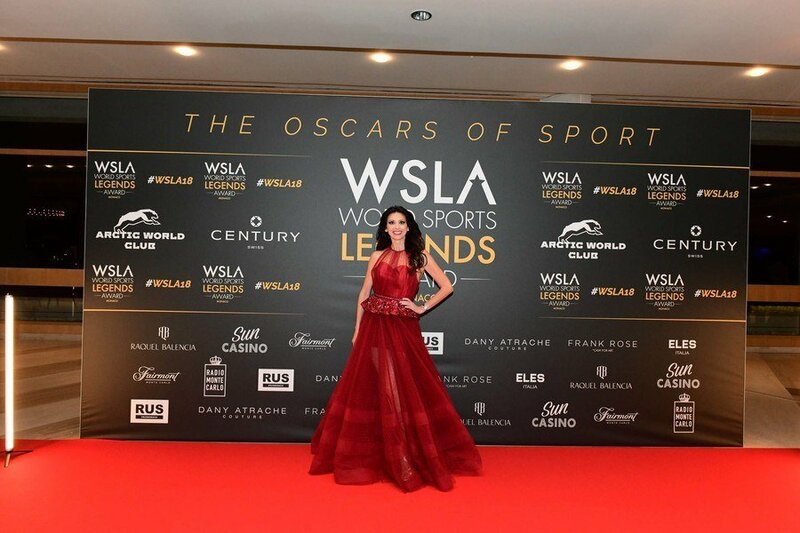 on the Media Day she wore Dany Atrache for the Press Conference followed by the Awarded Dinner. 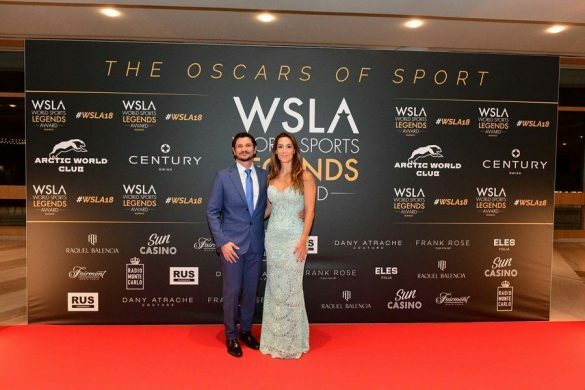 For the WSLA Talk Show held on the Media Day Lorena Baricalla wore a series of couture dresses Made in Italy from the new 2018 and 2019 collections by Raquel Balencia, Spanish fashion designer Milano based. As well, she wore precious watches by the exclusive Swiss brand Century Time Gems. The brand Eles Italia dressed some of the guests on the red carpet and created the outfits for the hostesses on stage. 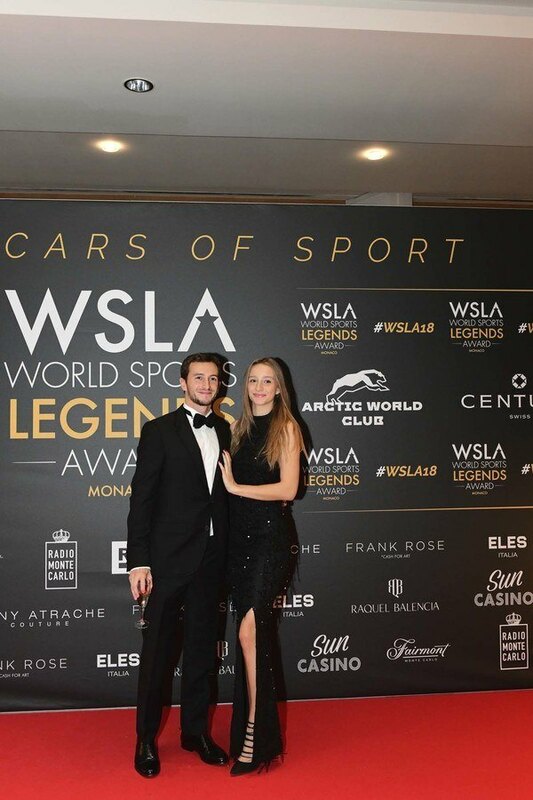 The World Sport Legends Award’s Red Carpet is among Monte Carlo’s most prestigious and has become the place to be. Consequently, the event was attended by a fine array of world sporting champions, international stars and VIPs. Among this year’s guests were Johann Zarco, MotoGP rider; Antonio Giovinazzi, F1 driver who has joined the Alfa Romeo Sauber F1 Team; Stéphane Richelmi, LMP2 driver in the Jacky Chan DC Racing Team; the MotoGP Champion Virginio Ferrari; Gianluca Montiron, MotoGP Team Principal; the Italian synchronised swimming champions Linda Cerruti and Costanza Ferro; the TV Presenter Yann-Antony Noghès who received the “WSLA Posthumous Award” in 2016 on behalf of his grandfather Anthony Noghès. From the leading business sector Sergey Egorov of Arctic World Club. From the fashion world the fashion designer Raquel Balencia and the fashion designers Stefania and Silvia Loriga of Eles Italia. The Red carpet was over 50 metres long and was decorated with the works “WSLA – Art meets Sport”, created by Marcos Marin, Official Artist of the Foundation of HSH Prince Albert of Monaco, who also conceived the Oscar “statuette”. 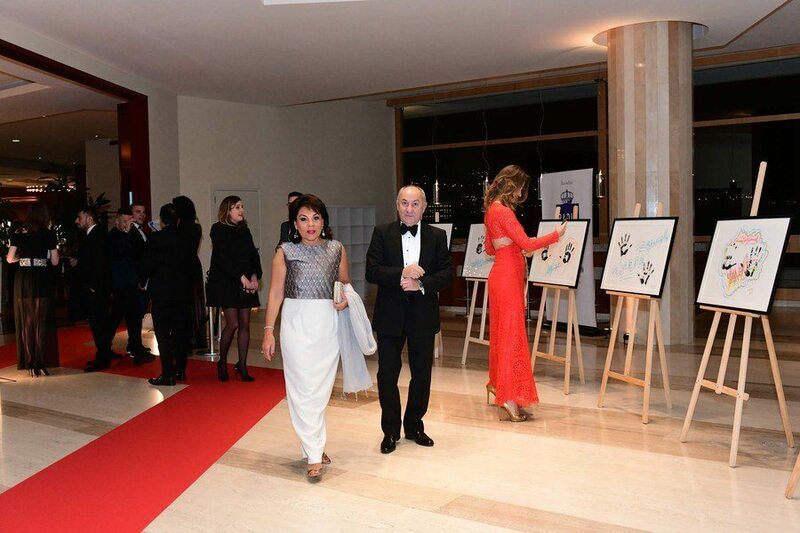 The “Pantheon of the World Sports Legends” was also exhibited, reuniting the handprints which were realized in previous years with the awarded champions. 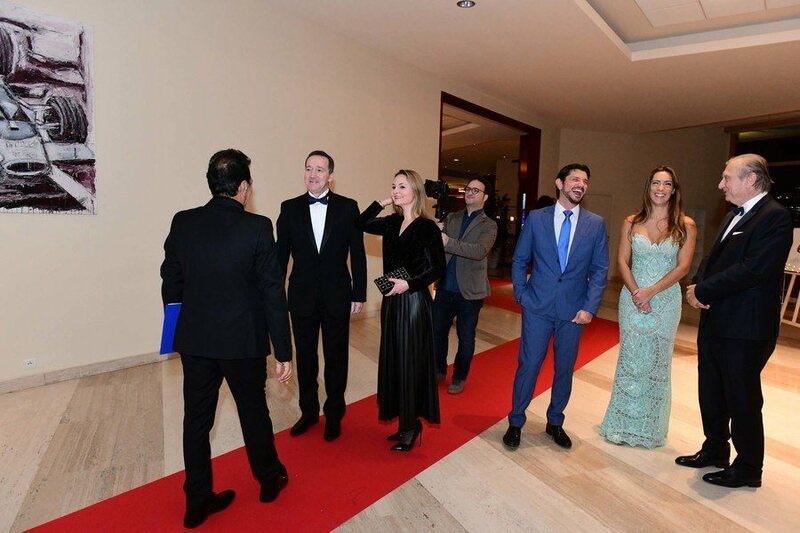 The Gala, conceived as an American-style show, included entertainment with performances by the corps de ballet, the orchestra, and the guitarist Massimo Borelli. Lorena Baricalla gave a moving performance of the song ‘I dreamed a dream’. Voice-off was Nick the Nightfly from Radio Monte Carlo. The Menu was especially created and prepared by Didier Aniès, Head Chef at the Fairmont “Meilleur Ouvrier de France”, in partnership with the Prince Albert II of Monaco Foundation, with the undertaking to highlight local and seasonal products and to follow the Mr Goodfish programme for the sustainable consumption of seafood. The first day of the programme featured the Media Day on 7th December. In the venues of the Fairmont Monte Carlo, and included the WSLA Talk Show “Sporting Stars: The Men or the Women behind the Champion” and “Show, Art and Fashion” hosted by the Ambassadress Lorena Baricalla; the Handprints Show for the creation of the champions’ handprints by artist Marcos Marin; and the Art Show put on by Century Time Gems, Official Partner of the event. Then, the Official Press Conference was held in the late afternoon in the Salon des Princes at the prestigious Automobile Club de Monaco, followed by a cocktail. 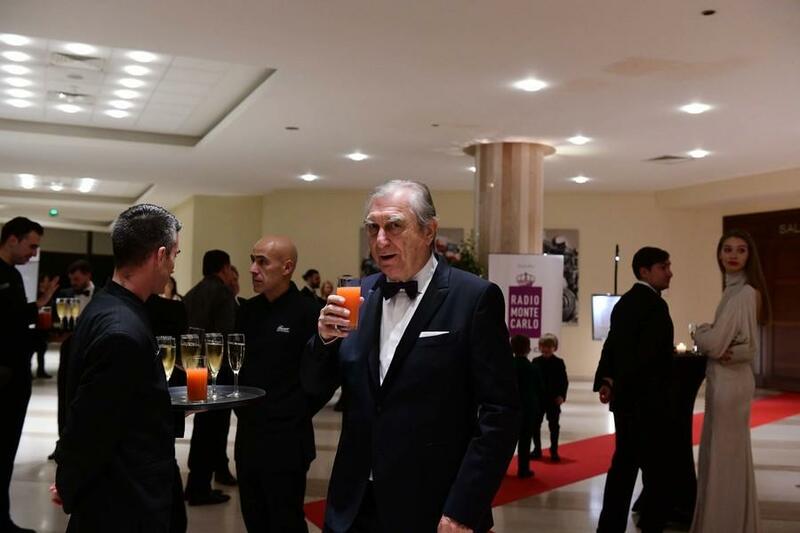 Finally, the day concluded with the Awarded Dinner in the Automobile Club de Monaco’s exclusive and private “Cellier” (the Cellar) – a privileged place that can only be accessed by VIPs at an international level. 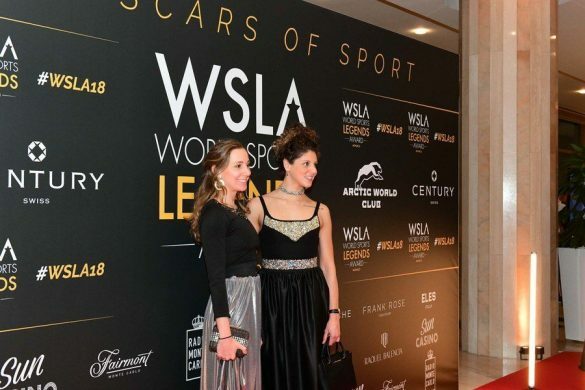 On 8th December the Awards Ceremony with a Gala Dinner-Show was held in the Salle D’Or at the Fairmont Hotel, preceded by the Red Carpet with Cocktail in the Crystal Gallery. 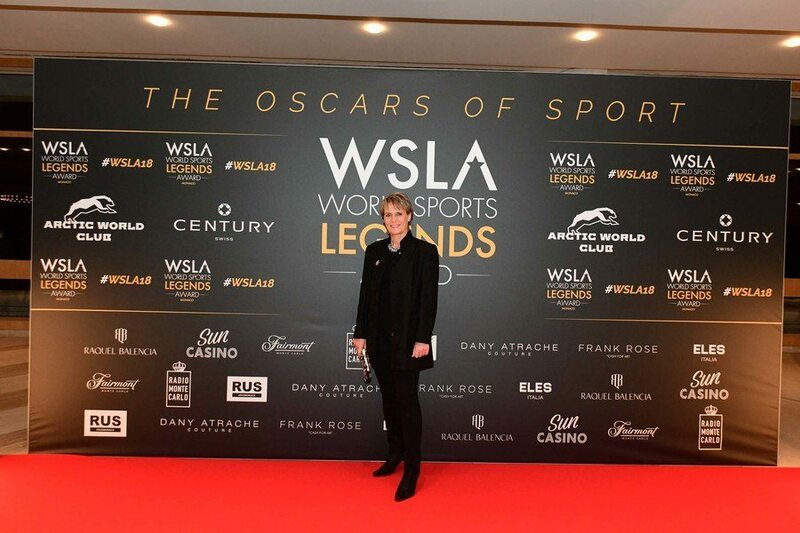 The prestigious evening ended with the After Ceremony Red Carpet and the WSLA Party at the Sun Casino. The WSLA is an event which is enjoying ever greater success, and only two years since its inception, on its 16 social networks and web channels, the photos and videos of the Oscars of Sport attract round 4,200,000 views per year.